Nigerian herbalists under the Umbrella of National Association of Nigerian Traditional Medicine Practitioners (NANTMP) have offered to treat Buhari of his ailment. Adesunmiboye Fawawo, the group patron made this disclosure in Osogbo in a chat with the media yesterday. 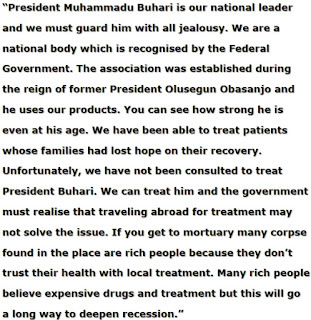 He said many Nigerians are dying cheaply because orthodox medicine is a killer machine.